On July 22, I witnessed a white truck race out of the building site of the Glen Condominiums on Kingston Road right across from my law office. A moment later I heard the horrific scream of a dog being hit, and watched as the shaken owner and neighbours rushed to an emergency veterinarian office. He was scraped by the axle of the truck and managed to just escape from underneath the carriage. I have not heard further but am hopeful the dog has recovered. It brought to mind the efforts of a group of frustrated and deeply concerned Beach residents to address the issue of heavy trucks racing in and out of the Bellefair Kew Beach Residences development at Bellefair and Queen. Their concern is that school children, the elderly, other pedestrians, and pets are vulnerable to the volume of heavy trucks feeding the ongoing construction of condominiums on Queen Street East. These residents have noted a few close calls. They have also hit a bureaucratic wall trying to get a resolution to a serious problem. The law of the road has become so confusing that many residents feel the system is beyond broken and that the issue will only receive attention when a tragedy happens, like a child being hit or killed. The law is a mess. Road restrictions are covered in Schedule 30 of the Toronto Municipal Code. All residential roads between Kingston Road and Queen Street East, from about Woodbine Avenue to Victoria Park Avenue, have restrictions against heavy vehicle traffic. 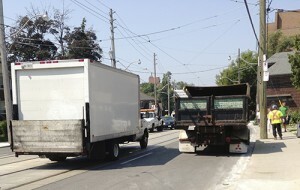 In fact if you stand at the corner of Bellefair and Queen Street you will see signs that read no heavy trucks. Kingston Road itself has no restrictions, while Queen Street East has a small restricted area between Kingston Road and Woodbine Avenue. But there are exemptions to the restriction of heavy trucks on the basis of necessity that essentially nullifies the entire restriction. In other words, heavy vehicles may not travel down restricted roads such as Bellefair Avenue unless it is impossible to otherwise reach their destination, or if making a delivery. This means that a heavy truck travelling on a restricted road where no alternative exists, or making pick-ups or deliveries, is actually exempted from the restriction. Truck traffic outside an East End development. Residents have contacted their local councillor, the local police division’s traffic response unit, and the city official in charge of transportation bylaw enforcement with their complaints but the problem remains unchanged. One result is that Ward 32 councillor Mary-Margaret McMahon requested that an e-newsletter be circulated by developers to residents, although it is unclear what purpose it would serve in light of a law that allows heavy trucks to travel in restricted zones on residential streets. It is easy to understand the frustration and anxiety felt by residents. To their credit, the Bellefair developers have hired a paid-duty police officer to help regulate traffic. This is not foolproof however, and is strictly voluntary. Surely more can be done. The problem is too serious to ignore. The road laws impacting our lives are broken and dangerous. What is required is the political will at the provincial and municipal level to jointly revisit the issue for the public good. If trucks must deliver to restricted areas and have access to residential streets, then the rules can change. New reduced speed limits for heavy vehicles on residential streets can be implemented. Condominium developments can be legislated to hire paid-duty officers to regulate traffic. Liability laws can be expanded to ensure there is deterrence for speeding trucks along residential streets. A group of dedicated citizens can make change happen, but political will must be in place as well to avoid a serious accident or a tragedy taking place.